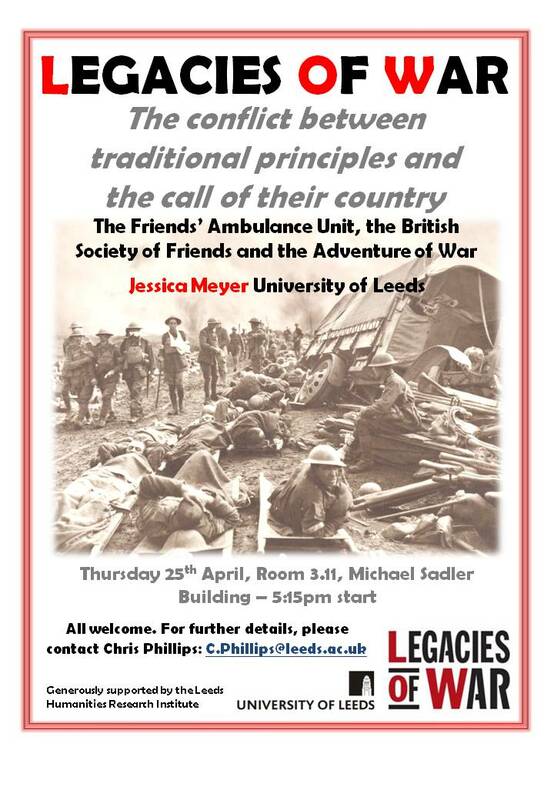 The following bit of advertising feels a bit awkward, as it is for my own paper, but the next meeting of the University of Leeds Legacies of War Seminar will take place on Thursday, 25th April at 5:15 in Room 3.11 Michael Sadler Building. I will be talking about the conflicts between a desire for masculine adventure and religious principles among the founders of the Friends’ Ambulance Unit. All welcome. This entry was posted in First World War, Gender, Legacies of War, Masculinity, Seminar and tagged adventure, Friends' Ambulance Unit, Legacies of War, seminar. Bookmark the permalink.